Eseyas and his mercenary messengers’ General Sebhat and Brigder General Eyob (halibay) oath on the name of martyrs not to shoot towards the office of the president, by claiming that they too were also raising similar democratic demands. In one way they were doing their best to save Eseyas and on the other hand they were buying time in preparing a trap for the leaders of the operation. The moment they decided to leave the premises of the Ministry of Information, they were followed after and imprisoned with one forced to commit suicide than surrender. Here it needs to be mentioned that there was an enduring enmity between the commander of mechanized staff Tsehaye Mokenen and colonel Wedi Ali. In 2000 Major-General Gherezgiher Ademariam (wuchu), under the influence of alcohol told to Wedi Ali that Tsehaye was planning to execute him by of accusing him as a member of Fiveth column, i.e Islamic movement that used to carry out military operation on the western lowlands of Eritrea. This was one of the reasons for Wedi Ali to decide to shoot him without hesitation, when Wedi Moke attempted to grab a gun from one of his body guards. The meeting that was scheduled to be held on the premises of the Ministry of Information was suddenly changed to the office of the president. Not only the heads of the regional administrators, the president also called all his ministers for a meeting. This was intentionally done to use them as a cover for any eventuality in the showdown. Among the regional administrators Mr. Mustofa Nurhussien, administrator of southern region, failed to attend in the meeting excusing sickness. Some individuals betrayed the organizers of the plot by leaking the information to the president beforehand and the situation was aggravated by the lack of communication between the different groups that were taking part in the operation. And this proved to be a decisive factor limiting the operation from achieving its intended objectives. The radio communication of the military leaders was under the control of the president’s office, and they had no other alternatives of communications at the time. When it became clear that the president got information about the planned operation, some of the senior military leaders, who were supposed to play a role in the event, decided to remain neutral instead. In spite of the betrayal by the generals and ministers, they have never sided on the side of the president either. 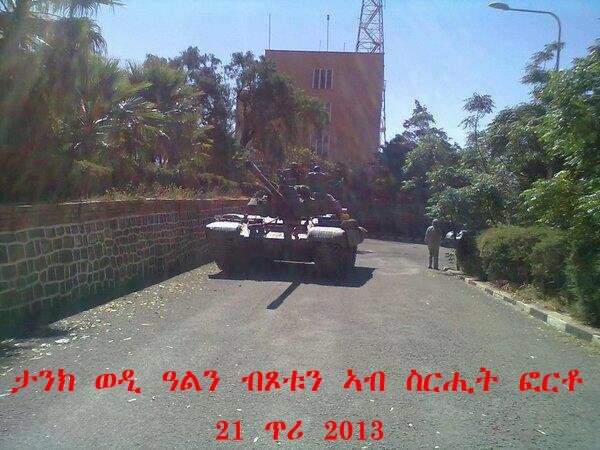 It was General Sebhat Efrem, who turned out to work relentlessly to save the president from his ultimate demise. On that day, he was seen to get in and out the president’s office six, seven times. He went back and forth to Major-General Filipos Weldeyohannes office in Kehawuta five times. In addition, he went five, six times to the Kagnew station, were a special forces are stationed. He played an exceptional role to save the president from the imminent danger. In spite of General Sebhat’s desperate efforts, Major-general Filipos Weldeyohannes never moved from his Kehawuta office during that day. Starting from the last six months, Asmara residents were clandestinely hearing rumors that the generals will began challenging the president soon. The rumors were ‘under the direct leadership of General Sebhat, they were holding constant meetings’. General Sebhat turned out, he was the one playing a leading role to defuse the situation in the president’s favor and it is now widely believed it was himself, who leaked about the secret operation to the president. Now all eyes of the public and the military leaders are aiming towards General Sebhat Efrem, possibly some would take revenge against him. This incident was his third betrayal in the decisive moments of the country’s history. Even though, he is practically frozen from his active duties as the commander of Eritrean Armed forces, his office Ministry of Defense is run via colonel Tesfaldet and Brigadier-general Tekle (Manjus). Hence, it is very puzzling to the public, why is he trying to defend the president at such a critical moment. Eseyas, even though he knew that this movement was not carried out without the prior consent of the top military generals, fearing immediate reprisal, he is taking action against the law ranking officers and colonels for now. So far, up to sixty people are believed to have been imprisoned. Among the senior leaders only Mostofa Nurhusien, administrator of southern region and Abdela Jabir, head of organizational affairs of the ruling party PFDJ, who under under arrest at the moment. Akal what r u talking about eti tiblo zeleka eba astebhilelu ?